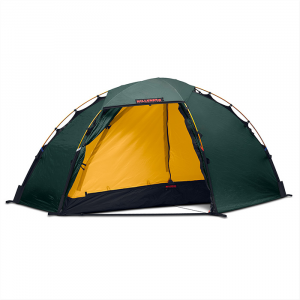 High quality, four-season tent offers plenty of floor space and peace of mind. Zipper issue. (23/10/2017) I'm amending this review again, another two years down the track, and four years from my original review. The tent is now more than six years old. 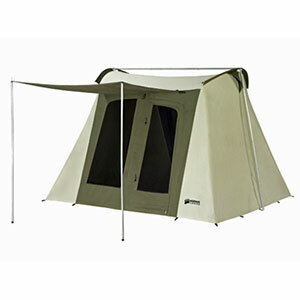 We have continued to use this tent in the Californian Sierra Nevada and the Australian Alps; it is our only tent. I guess we would have camped somewhere around 150 nights in the Venus 2 now. Since my last amendment we have camped in high winds and snow and continue to be impressed and charmed by our little mobile home-away-from-home. We have had the original inner tent zippers replaced with heavier zippers. This was costly, but worth it, as the zippers have not given us any hassles since we had this done. We have also purchased a new fly for the tent. The old fly was still working fine, but we were heading into remote country in shoulder season and didn't want to risk having the pole sleeves rip in high wind (they were looking a little worn). We will still use the old fly on short, local, less remote camping trips to preserve the DWR of the new fly. The only area of wear worth noting is that the elastic in the bands/straps which hold the tent inner in under the exoskeleton-framed fly has perished a bit, so that the inner sags a bit and hangs into the space a bit more than it did originally. I will probably look into getting these straps/loops shortened a little so that the tent inner is a bit tauter. 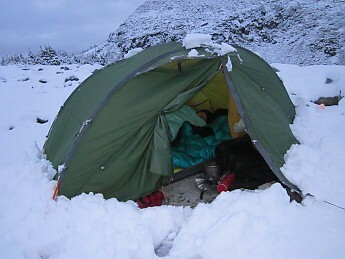 But we are now talking about a tent which is 6 and a half years old and has had an adventurous life, so no big deal! In summary (lots more detail below) we keep looking around for a lighter tent for our alpine backpacking trips, as most others do not carry so much weight and bulk in a tent. However, every time we are caught in storms, snow, subzero temperatures and high winds, we feel so glad that we have this wonderful tent with us! It is so easy to set up on pretty much any site; we can hike into the dark and pitch it in minutes! (1/10/15) I'm amending this review, initially submitted two years ago, as we have now had our Venus 2 for nearly four years, and have used it for approximately 70 nights camping, mostly in the Californian Sierra Nevada but also in the Australian Alps, some Australian bush and coastal camping. We've used it in hot weather, but mostly summer alpine conditions 8,000 to 12,000 feet. It has been in heavy rainstorms (one dumped 3.5 inches on us over 17 hours), heavy hail, and moderate winds (not high winds). We camp a lot on bare granite above treeline. Many nights are around freezing temperatures. We have not used it in snow. The tent is easy to set up, and one of the great things is that the fly attaches to the poles (Exped calls this an "exoskeleton"); the inner tent clips onto the poles on the inside, hung beneath the poles. So one erects this tent by erecting the fly with the tent already attached inside. Setting up in the rain, the tent stays dry. We have set up in absolutely pelting rain, and kept dry. Exped has a great instructional setup video on their website which helps to learn how to do this efficiently. It's a 2-person tent — we generally set it up together, with one person feeding the poles through the sleeves, and the other helping guide the pole end and avoid damaging snags. Despite this, it is still showing some wear on the fabric of the pole sleeves and some pinhead sized holes where there has been some snagging on occasions where one person has erected the tent by him/herself, and has pushed the poles through the sleeves. There are three poles: two long poles that do not cross — they run parallel like a sideways tunnel (you'll need to see the photos!) — then a third smaller pole that runs across the top — fabulous space maximizing design! Inside, the walls rise from the floor almost at right angles, meaning lots of space and no claustrophobia. The whole thing stretches taut with easy adjusters, is free standing, and we have even been able to pick the whole thing up and move it in the middle of a rainstorm, keeping the contents dry inside! The tent is stable in wind, and can be used on rock using rocks to secure it. There are plenty of guying points. On softer ground, so long as you have the two vestibules pegged out, (with two pegs!) the tent is freestanding. We always trust this tent totally to keep us warm and dry. It has never leaked. We have been in a hailstorm so loud we had to shout over it; we couldn't believe the thin fabric of the fly came through unscathed. The bathtub floor works perfectly, we use a home made Tyvek groundsheet to protect it from the sharp granite, and it is still totally waterproof. The fly is 40D polyurethane coated polyester, with 1500mm rating. The floor is 70D taffeta nylon with 10,000mm rating. Condensation is not an issue with this tent. 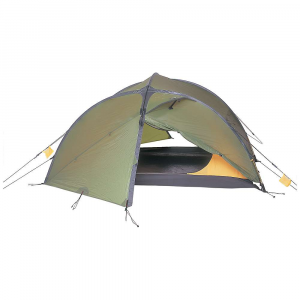 There is a good airspace between the fly and the inner tent, and two little ventilation peaks for the fly. In very cold wet weather of course we got some moisture on the inside of the fly, but it never dripped in on us, and therefore was not a problem. Occasional small drops landing on the top of the tent inner just ran off the outside of the tent. The tent comes with a little gearloft, like a little mesh ceiling, but we have removed this to give us more headspace. It is easily detached and reattached.We use a tent light and objects placed in the gear loft blocked the light. There are ample pockets and foot room and the vestibules — we just didn't really need the loft as well! The bathtub floor comes up 3" or so from the ground, giving ample protection, and the tent fly comes down close to ground level - we have not had splash up problems. We have always used a Tyvek groundsheet for protection under the tent floor, as we camp on sharp granite a lot, but do not bother using a groundsheet in the vestibules. The vestibules are big enough to store large backpack, boots etc, and can easily be cooked in in rainy weather. The vestibule has a full length zipper and this can be unzipped and the "doors" rolled up, still leaving a slight overhang to protect the inner tent door from rain that falls directly downwards... I wouldn't use it like this in heavy rain. Exped is a big company, and is in Switzerland, and doesn't deal directly with customers (you need to go through a retailer). So my advice would be to make sure you buy one of these tents through a very trusted retailer, and check carefully what the warranty does and does not cover. To me, not covering something as essential as zippers is unacceptable! When we bought the tent, the design appealed to us for several reasons. It is long. We are not very tall people — my partner is 5'10" and I'm 5'5", yet in the past we have had troubles with our heads and/or feet touching the tent walls. We have plenty of room at head and foot for extra gear inside this tent.Width — adequate; we didn't need any more. The design means we have a door each, and can roll up the fly doors so we can lie looking out at the view from inside the tent. Our previous tunnel tent did not have a view — we love this aspect! Headroom. We can sit up in the middle of the tent without our heads touching the ceiling. Generous doors. The doors are very wide — the advertising says two people could sit side by side in the doorway. We have never really felt the desire or need to do this! — but you could. No permanent mesh yet great ventilation. The large doors are two-layered — tent fabric and bug mesh. So when it's hot you can have a LOT of mesh, and a breeze flowing straight across the interior of the tent. 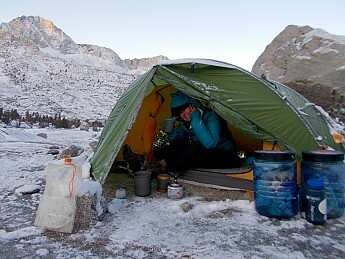 But when it's cold, you can have zero mesh and this means the tent really heats up from bodyheat and gets really cosy. I am a cold sleeper and get away with a much lighter sleeping bag than I would otherwise need, with this warm tent. Packability and weight: The tent minus its packing bags but including the Tyvek groundsheet, poles and pegs, comes in at 3kg (6.6lbs). The poles weight 540g of this. You can remove the inner tent and just use the outer fly as a single layer shelter, but we are unlikely to do this due to snakes and bugs not being kept out. It's pretty bulky by backpacking standards, but it is a two-person, four-season tent. Lots of people on the John Muir trail looked askance at our big, solid tent (they were all under tarps, in hammocks, and crawling into tunnels). But on the many days we were confined to our tent, we were happy and comfortable. We never resented carrying the extra weight. Summary: If not for the zipper failure of both doors, which has NOT been resolved by simply replacing the sliders, unfortunately, I'd be giving this tent five stars and we would be thrilled with it. The design, ease of setup, warmth, versatility, size and shape are terrific. I suppose I'm still giving it four stars because I have not heard of anyone else having this trouble with zippers on an Exped tent, so maybe we just got a lemon (?) Unfortunately, for us, this has undermined our confidence in what is otherwise an excellent product; our next tent, regretfully, will probably not be as good, but it will be from a manufacturer we can deal with directly. If I had paid $500 for a tent I would expect the very best and a very long trouble free life out of it. I have just sold my 30yr old Everest mountain tent and the only problem was wearing out the tray ground sheet of which the 3rd was fitted. Thanks for the update, Donna! It's great to hear that your tent is still performing well. My wife and I love this tent. When we are not carrying heavy climbing gear we like to use this tent in spring and autumn. 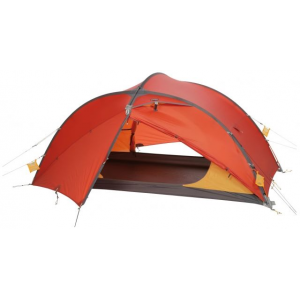 With climbing gear this tent is simply too heavy and bulky to carry. Tent inner and outer, together, weigh about 5 Lbs. Because of its exo-skeleton design it is not easy to split the tent into two (roughly) equal halves for two people to carry. So, invariably, one person has the poles and stakes to carry, and the other person has the tent inner and outer (rain fly). The tent pitches quickly and easily, and if it's raining or snowing, the inner tent stays dry since the rain fly and inner tent are attached to one another. Although it stands by itself, I would not go as far as to call it "self-standing." The four corners need to be staked-out securely, as do the vestibule. So, a minimum of 6 stakes for good weather pitches. For bad weather it would be that 6, plus another 4, or another 6 (12 in total) if the winds are howling. The doors are large and are mesh, backed with a fabric lining that can be zipped or un-zipped to your liking. So, the amount of interior ventilation can be adjusted, as well as the interior warmth. For cold weather we usually keep most of the fabric zipped in with an area at the top of each door with some mesh showing. Each corner of the tent, and the two vestibules, have adjusting guy lines — very nice. You can pull them snug once the stakes are in the ground. The tent has a nice gear loft, plus each of the 4 inside corners have mesh pockets. So it's easy to get yourself organized, and you can put socks in the loft to try to dry them. The vents on the rain fly can be closed, or opened with a velcro post. 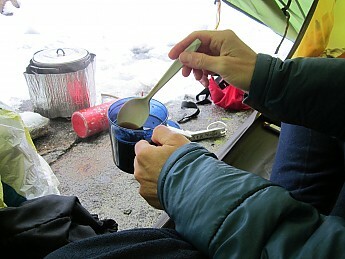 This can be done from inside the tent (you have to open the inner tent door to reach to the inside of the rain fly). The stuff sack for the poles, stakes and repair kit is awesome. The main stuff sack is good for storage at the tent at home, but we don't use it out on the trail. Instead, we use an OR waterproof stuff sack, their "durable" kind. 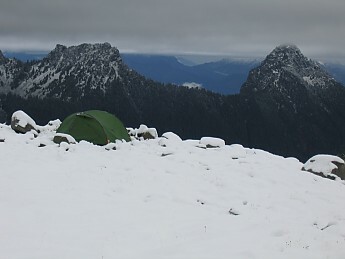 One night we were at La Bohn gap in the WA Cascades. It dumped 4-5 inches of snow in early September. The tent held up very well, and we cooked breakfast sitting inside the tent. We placed our stove just outside the vestibule. You could place the stove in a way such that there was no fire danger, but you could still reach the stove. In all my years of mountain travels that was the nicest/coziest breakfast I've ever had. The tent kept us warm and dry, we could cook, and get everything packed up (except the tent itself) and ready to go from within the tent. It's decently roomy inside for two people. You can easily fit boots and a pack under each vestibule. The fabrics are thick and durable (hence the weight). We love the cheery colors Exped uses for the inner tent fabric(s). We have never had even a drop of condensation in the inner tent. The yellow inner tent fabric is very breathable, yet keeps the wind out. 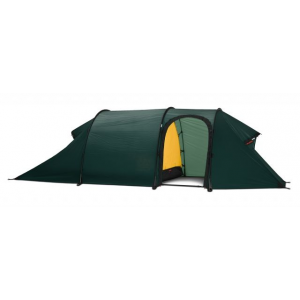 Overall we love this tent, only wish it was lighter and perhaps a bit smaller to pack. This is all about the tradeoff between light weight and long lasting durability. I would say that this tent leans towards durability. So, overall, a big "++++++" for Exped on its Venus 2. We had it out in some nasty winds. The weather forecast predicted 38 mph gusts. We had no measuring device, so we can't be sure how fast the winds actually were, but there were some tremendous. Truly scary. Gusts and the tent was fine. In fact being inside the tent we felt almost no wind and the tent did not deform. We love the Venus II!!! Thanks for another helpful review of your tent, pula58. I'm also enjoying the pictures of where you and your tent have been! Thanks for the update, pula58! Where were you (and your tent) where it was so windy? Lake Edna, Washington Cascades. It was so windy, we didn't sleep all night, but the tent held-up fine!